Replacement theology governs the Bethlehem College’s pro-Palestinian sympathies. It is a theology rooted in ancient Christianity. It falsely affirms that Christianity has replaced Judaism and Israel in God’s economy. The Christian Church is considered the “New Israel” or “the Israel of God.” For two thousand years, this theological stance has commonly misconstrued Bible narratives to defame Israel and the Jews. Within the “replacement” framework, Jews are marginalized— essentially demoted to a kind of spiritual surfdom. Accordingly, Jewish claims to their biblical inheritance of the land of Israel are null and void because the land is considered now a “universal mission” available to any and all claims, particularly those made by “native Palestinian” Arabs. One of the more extreme anti-Semitic libels of replacement theology is the idea that the Jews from Eastern Europe cannot claim their own Judaism because they are mongrel descendants of the Khazars, who infiltrated Europe centuries ago. Accordingly, the European Jews are not really Jews at all. How can they then dare claim Israel as their Biblical inheritance? The conference theme of “The Gospel in the Face of Religious Extremism” not surprisingly includes topics on religious extremism within Islam and Judaism. The conference schedule reveals the actual skew of the gathering. One segment titled “The Challenge of Christian Zionism” seems an odd, incongruous topic in a conference on “extremism,” unless, of course, the intent of the organizers is to demonize Christian Zionism as “extremist” by association. Including the topic of Zionism in a conference on “extremism” is tantamount to demonizing not only Jews but also those Christians who support the Jewish state. This is but one example of how Christian theology becomes a tool to undermine Israel. Hank Hanegraaff will present a paper titled “A Gospel Response to Christian Zionism.” Hanegraaff is well-known on Christian radio as “The Bible Answer Man.” His paper, like his anti-Zionist, anti-Israel theology, will likely diminish the commitment of Christian Zionists and thus try to invalidate those who interpret the Bible as God’s embrace of Israel. Hanegraaff is considered by some to be a reliable Bible scholar. But his Preterest theology denies Israel’s position as the prophetic fulfillment of God’s plans. Preterism, among its many components, is a form of replacement theology asserting that all of God’s prophecies were fulfilled with Jesus’ death and resurrection in the first century. Hanegraaff’s position is an example of Christian anti-Israelism in its purest form. According to Preterist scholarship, Israel as a state is merely an accident of history. Preterists like Hanegraaff are not the only theologians to claim that Israel has no more right to the land than the man in the moon. In 2013, the Scottish Presbyterian Church triggered an international firestorm with a “scholarly report” in which they circumnavigated the entire bible to assert that contemporary Israel was not the Israel of the Bible and nothing much more than a historical accident. As such, they concluded that Israel has no unique, justifiable claim to the land. Assuming Isaac’s paper is in agreement with his previous writings opposing Christian Zionism, he will likely assert that Zionists and their Christian friends are partners in an imperialist, colonialist enterprise from the very inception of modern Zionism in the late 1800s. Isaac, while he does not consider himself an anti-Semite, he is very negative about Zionism. Even the Christ at the Checkpoint logo features “the wall” and the “checkpoint” as two so-called proofs that Israel is anti-Palestinian without any acknowledgement of the role Palestinian violence may have played in Israel’s decision to build the wall. Like his close associates, Gary Burge, Steven Sizer and Colin Chapman, all of whom are or have been speakers at the Christ at the Checkpoint conference, Isaac incorrectly conflates dispensationalist theology with the Biblical Zionist claims of Israel’s rights to the land. Among the enemies facing the nation of Israel daily — Islam, European Union, anti-Israel political forces and Palestinian terrorism from within — Christ at the Checkpoint Conference will join in the chorus of those who work to destroy Israel by the power of words. The conference masquerades as a sincere effort to seek justice for oppressed Palestinians and bring peace to the region. In truth, it focuses less on seeking peace than on demonizing Israel — denying the Jews’ national legitimacy. “Any exclusive claim to land of the Bible in the name of God is not in line with the teaching of scripture” says the Manifesto in item five. Who could deny that “peace and justice” are worthy aims on both sides of the conflict? But therein, lies a questionable motive— called by some scholars, “Christian Palestinianism” or “Palestinian liberation theology” are theories which offer the Palestinian Arabs a free ride on “peace and justice” coattails. The Palestinians are no less than perpetual victims of so called Israeli imperialism and occupation. Christian Liberationism, a subset of replacement theology, derives from the political activism of the Jesuits in South America in the 1950s. Liberationism views Jesus through a lens of socio-political populism on behalf of the underdog Palestinians even going so far as to claim Jesus was a Palestinian. Liberation theology paints Jesus as a kind of messianic zealot of the second temple period. In the most extreme cases of Liberationism, such as in Sabeel’s Palestinian Liberation Theology, Jesus is a Palestinian prototype— he is identified with the Palestinian cause and represents Palestinian suffering in his life and his death. The Black Liberation theology of pastors like Jeremiah Wright, espouses black nationalism, anti-Judaism and anti-western rhetoric. Liberationism in its variety of parts is a frequent tag-a-long with extreme, anti- West and anti-Semitic sentiments. Jesus describes his own role as advancing the kingdom of God among the Jews. But there are others who ascribe far more than that to his mission. In the most far- reaching applications of Palestinian Liberationism, the Palestinian Arab cause, has significantly more validity than the Zionist enterprise which, at best, is an interloper in a Palestinian utopian fantasy. Such figures as Stephen Sizer (Anglican) and Naim Ateek (Sabeel), both from Anglican roots, hobnob with Iranian and other Muslim Arab extremists to somehow emphasize their accusation of Israel as an imperialist, colonialist occupier of Palestinian land. The Liberationist movement has made some very strange bedfellows. Alliances between the World Council of Churches, Sabeel, Christ at the Checkpoint and its sponsor Bethlehem Bible College, Presbyterian Church USA, United Church of Christ, Eastern Orthodox Churches and even secular organizations like Boycott Divestment and Sanctions (BDS) have collaborated to undermine and demonize Israel and salute the Palestinian flag. Promulgated by the “Christian Palestinianists,” the idea that Israel, at its core, is responsible for every evil on the face of the earth, is libelous, anti-Semitic fiction. At the unfortunate Christ at the Checkpoint conference, distortions, false accusations and innuendo against both Christian and Jewish Zionists as “extremists” are covered in political platitudes and religious rhetoric. 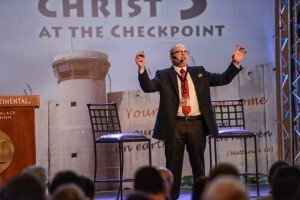 The Christ at the Checkpoint Conference is just another tedious example of how name-calling and demonization of Israel masquerades as a legitimate Christian enterprise. the Scriptures and ask fervently for the Holy Spirit to reveal His truth. There is some good news in this report. About 600 so-called “Christians” attend this horrible conference every two years. It is estimated that there are 2.2 billion Christians worldwide. This means that the attendees comprise only 0.0000027% of all Believers. Sadly that’s still 600 too many!! Hal and Linda are spot on…the time for those in attendance to actually read the Bible is long overdue.